Preposterous. 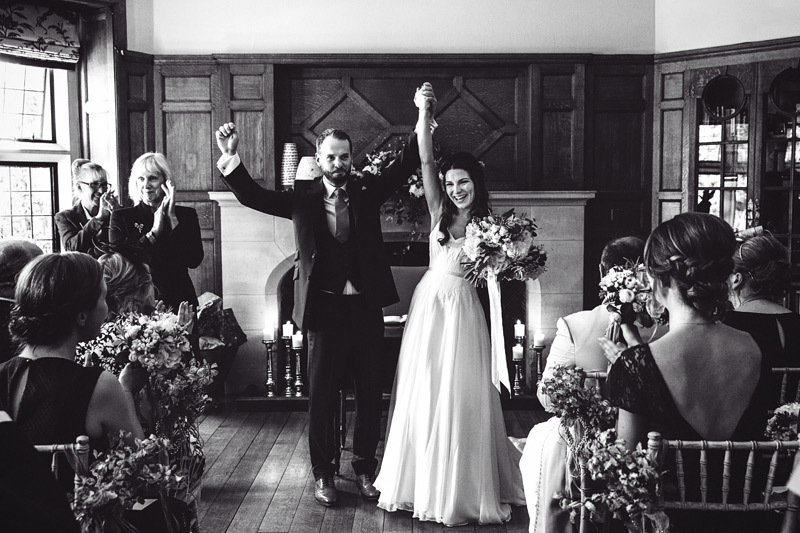 The word kept vaulting around my mind throughout Emily & Matt’s wedding day, though entirely stripped of any unfavourable connotations, clad instead in entirely positive tones. Positively preposterous. Preposterously positive. The enormity of… everything. Emily’s dad cooking for what I estimate to be around 200 people. Her mum spending weeks scouring the north-eastern quarter of Northern Ireland for flowers, wild and cultivated. A host of family and friends worked double-time and more to bring everything together come the week of and the day of the wedding itself. A palpable and enormous sense of community in it all. Aside from the marquee, I was the only thing they didn’t make themselves. I was totally made up by the experience though, which is an awful pun but that’s just what I was; totally made up by the experience. I wouldn’t be at all surprised though if they got back to me to tell me that one or more of their party had actually made the marquee from scratch. I’d first encountered Emily – but then ever so briefly – at a wedding in Dorset four years earlier, that of Kataya & Richard. Amidst the flurry and whirl of engaging in observational photography, on request I’d taken a posed photograph that featured her before reverting to the hunt for unposed moments of human interaction. When it came time to edit the images from that wedding I came across that photograph and was struck powerfully by the sense of a particular spirit emanating from this individual. It’s only on a handful of occasions in my practice as a wedding photographer – and then so with at least a digit or two to spare – that I’ve allowed myself to behave in so presumptuous a manner but I chose to include the photograph in a blog post and tagged on a note to the effect that my services as a photographer were offered, should they be required in future. I practically scandalised myself in doing so but the resolute notion that there was something of worth that might come out of the intimation won the moment. Three and a half years passed. Not that I was awaiting a response :~) Three and a half years passed then out of the blue I received an email from Emily which proved that I’d done the right thing. Or maybe she would have contacted me anyway, solely based on the results of the photographs I’d produced for Kataya & Richard. Well, at least my presumptuousness hadn’t scuppered the prospect of my being commissioned to photograph a certain wedding. Emily told me of a brilliant man that she was now engaged to, we discussed potential dates and my availability and everything worked out just perfectly, then of a weekend of cross-country travelling I was able to meet up with her and Matt and found that Emily was everything that I’d sensed from that one photograph and that Matt was exactly as she had described. The time that I spent with them throughout their wedding day built upon this estimation. If the world is a tapestry within which people are threads travelling hither and yon, their paths crossing to create patterns, a picture, then these individuals, these threads, are the type that contribute to the making of a picture I’d most like to see of that world. It was an enormous pleasure to me to make pictures for them and for the truly, really very excellent collection of characters that shared in their experience. 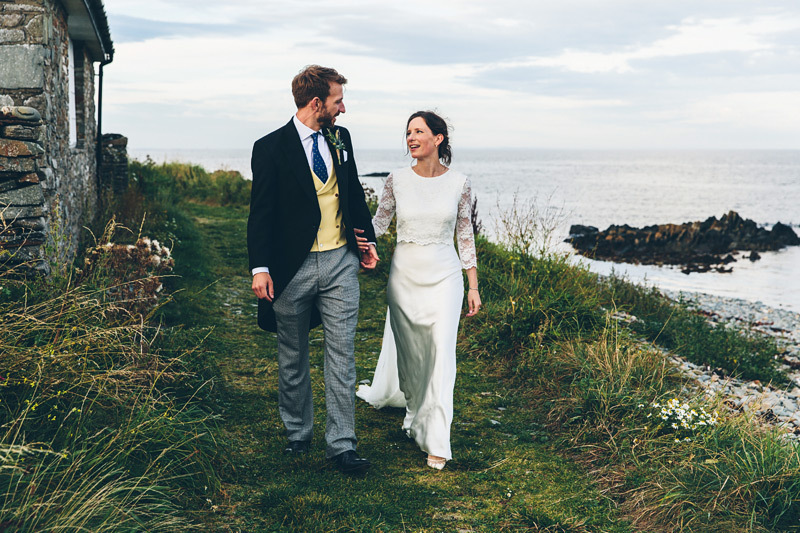 Emily & Matt’s wedding was set on the Ards Peninsula in County Down, Northern Ireland. They married at The Portico of Ards in Portaferry, an amazing building fashioned in the Greek Revival style. Two of Emily’s grandparents had themselves married there. 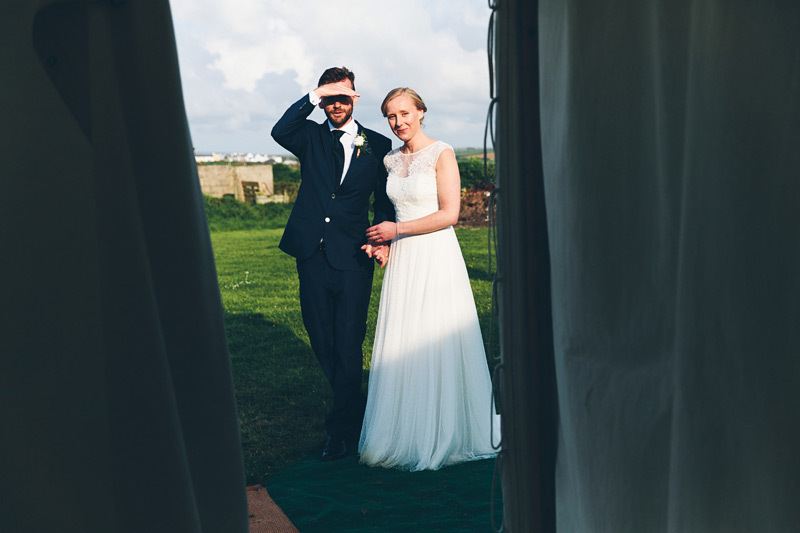 Celebrations ensued on the coast of the Irish Sea in and around a giant marquee on a harbour-side, next to an old lighthouse keepers’ cottage where Emily had spent numerous childhood holidays and where she and Matt had become engaged. This is an important thing to me. To gather the right words for this story. This was an important wedding to me, to be at, to photograph. Not to diminish how much I give myself to every wedding that I photograph but there is a particular story to this, one which requires words to relate while the images relate the beat and pattern of the day in their own essential way. I felt as though I were a bridesmaid of sorts myself on Hana & Doug’s wedding day. Bridesmaids and groomsmen serve an important function in lending support, practical and emotional, to a couple. I was there to perform a particular role, that of documenting the story of the day in images. That I did. I thoroughly enjoyed the role. I always do. I was made to feel though that the value of my presence was intrinsically as important as the value that would be brought to bear in the images that I would produce. That, to me, was a very big thing. I first met Hana some four years earlier. She was a bridesmaid to Sarah, when Sarah married Jon. Hana exuded a powerful sense of loyalty towards and protectiveness over Sarah. I found her energy a little intimidating. At first :~) After that wedding Hana started to share my work with her friends and colleagues; not just that from Sarah & Jon’s wedding but others that I photographed and blogged subsequently. We followed each other on Twitter. I spotted her tweet to a colleague, excited that I’d blogged a new wedding. That, to me, was a very big thing. Another of her colleagues, Natasha, booked me to photograph her and Sam’s wedding the year after Sarah & Jon’s. That, to me, was a very big thing. A lot of big things adding up. This was an important thing to me. I next met Hana a couple of years later, at Nic & Curt’s wedding. Nic had also been a bridesmaid to Sarah. The three of them, Hana, Nic and Sarah, have been best of friends and thick as thieves since being knee high to a grasshopper. Or maybe it was from the age of seven or thereabouts. In the immediate lead up to Nic & Curt’s wedding I’d corresponded with Hana on the subject of appropriate colours for nail varnish at such events. A colleague of her’s had insisted that a certain colour was inappropriate, for certain reasons. I sent Hana a picture or two of the apparently inappropriate colour used to perfectly appropriate effect on sets of nails at weddings I’d photographed. She painted her nails a different colour that day anyway but I’d enjoyed the collusion all the same. And it was at Nic & Curt’s wedding that I met Doug, which made for a great pleasure. He was there with Hana. Late into the evening Doug engaged me in conversation about my work. Hana had been showing it to him with some enthusiasm. That, to me, was a very big thing. Doug related to me what he understood from my work, what he understood about the underlying rationale of what I did, certain things that underscore the surface nature of the imagery alone. He clarified for me a number of things that I am largely unconscious of as I go about doing what I do. 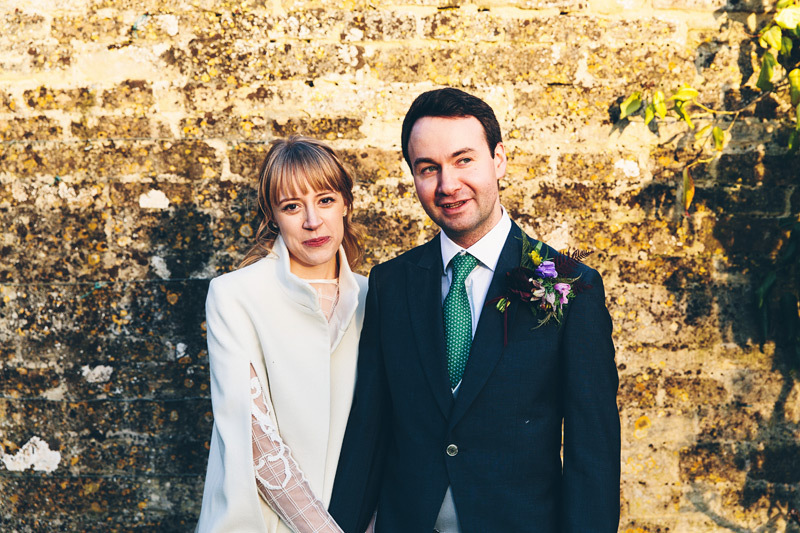 When I mentioned to Doug – on meeting up with he and Hana in the run up to their wedding – how much I’d appreciated his insights on that occasion, he told me that his recollection of what he’d said wasn’t at all clear but… in vino veritas, I say. Come to think of it I’m not at all certain I say that too often but erudite minds have a way of soaring gracefully in such conditions and it was a great pleasure to meet Doug’s mind and to find another character of value. Almost a year after Nic & Curt’s wedding I received an email from Hana, then on holiday in Spain with Doug. He had proposed to her the previous day and she had accepted. They wanted to know if I had any dates free for the following year. 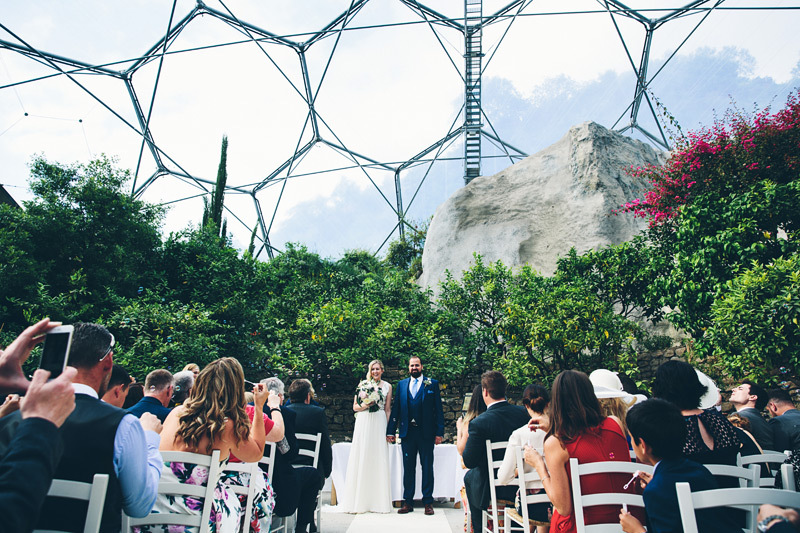 Sarah & Andrew married and celebrated their wedding in a verdant Mediterranean garden floating through space in an expansive dome, drinking in the day’s sunlight, looking out onto a cinematic expanse of stars at night and sheltering all from the odd bit of rain between those two points of the day. I’d not expected to encounter rain in space. It didn’t hinder celebrations in the slightest, all the same. Sarah had been a guest at two previous weddings that I had photographed; firstly that of Sarah & Jon back in 2012 then at Ruth & Neil’s wedding in 2014. I just looked through the entire set of images from Ruth & Neil’s wedding to see if Andrew was there too, and he was indeed. I have one photograph of the back of his head. I made up for that come his and Sarah’s wedding day. Ruth & Neil had also been guests at Sarah & Jon’s wedding (Ruth had delivered a reading). Also at Sarah & Jon’s wedding was usher extraordinaire, Adam, who with his fiancée Rachel was a guest at Sarah & Andrew’s wedding. Six weeks later I would find myself photographing Adam & Rachel’s wedding and meeting with Sarah & Jon, Ruth & Neil and Sarah & Andrew all over again. A veritable skein of weddings my experiences of which have traced the line of a strong thread of friendship. It was at Abi & Matt’s wedding way back in yesterday ago that I observed, and photographed, a particular act of singular kindness and inclusivity. Two page boys and a flower girl were lined up outside the church doors, two metal pails and a wood woven basket filled with confetti for each emerging guest to take a handful. One guest stopped in front of the first page boy, stooped down and I heard her say, “A bit from you,” then from the next, “A bit from you,” then moving to the flower girl, “And… a bit from you.” And that guest was Lottie. A simple but deeply resonant act. I’ll confess that at that very point I found myself thinking, “That’s a person whose wedding I’d love to photograph,” and a wish of sorts very firmly came true when a little time after Abi & Matt’s wedding, Lottie got in touch with me to share her own wedding day plans and to ask if I’d like to come to Cornwall to photograph her and Maurice getting married and the ensuing celebrations. I’m always excited by the prospect of a visit to Cornwall, doubly excited to combine such a trip with a wedding to photograph and triply so to immerse myself in such a day amongst what promised to be an especially fine company of people. So this is my typical weekday routine… bear with me, I’ll get to the actual point in due course, as ever. This is my mind at work though. This is, ultimately, how I photograph things and why I photograph them the way that I photograph them. It’s entirely underpinned by the way that my mind works. The all and the everything of me. This is my typical weekday routine: Having had breakfast together, I take my daughter to school, I come home, I sit at my computer and edit images (and a few other things interspersed throughout that process; responding to emails and the like). I take a break for lunch, return to editing images (or as and when I’m able – as it’s such an important thing to me – I sit and do what I’m doing now and pen a blog post the penning of which will most likely come to a conclusion several hours hence), collect my daughter from school and then it’s a whole tombola of homework and dinner and out for weekly activities and brushing teeth and bed-time and then I… sit down to edit images (or as I’ll do tonight, continue with the penning of a blog post) until midnight. Give or take five or ten minutes. That was it! Lunch. It’s my habit to watch something whilst eating my lunch each day; maybe an episode of some series or other that I’m working my way through or perhaps a one off programme of some genre or other. In the lead up to Camilla & Tom’s wedding I’d been spending my lunch times working my way through The Brain with David Eagleman on BBC iPlayer. It’s a fantastic series and I dare say a transformative one. At least it was for me and my understanding of myself and the world that surrounds me; most importantly the variety of ways in which people think; more so again how broad clusters of types of thinking seem to come about. I would have liked to have borrowed some of the subroutines from their minds and used them to refine some of those that inform the way my own mind works.